Warm, Comforting Heat From Infrared Light – The Dr. Physio Also Offers A Soothing Heat That Reaches Deep Into Muscle Fibers To Release Tension, Stress And Even Pain. Please Note That Maximum Temperature Achieved Is 40 Degrees C Through Infrared Bulbs For Your Safety And Comfort. Product Of USA With 1 Year Warranty In India: Designed By Nureca Inc USA , Award Winning Design For Maximum Pain Relief. Get 1 Year Full Product Support And Warranty In India. Relax Sore Muscles And Release Stress With A Powerful Shiatsu Massage You Can Give Yourself! Massage Is One Of The Most Effective Ways To Release A Long, Hard Day That’S Packed With Stress, Tension And Tight Muscles. And While You Can't Always Have A Masseuse On Hand To Rub You Down And Make You Feel Better, You Can Get The Next Best Thing With The Dr. Physio Heated Shiatsu Massager. 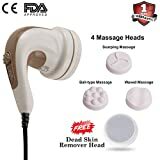 Deep, Relaxing Comfort Experience A Spa-Quality Massage In The Comfort Of Your Own Home With The Four-Node Shiatsu Massager. 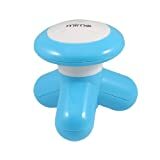 With Soothing Heat To Release Tension, An Active Muscle Massager That Pushes, Pulls, And Pushes Away Stress And Tight Fiber Muscles, And A Versatile Design That Lets You Use It Almost Anywhere On Your Body, You’Ll Go To Bed Each Night Feeling Like You’Ve Massaged Away All Of The Day’S Worries. Versatile, Portable Design Our Unique Lightweight Massager Actually Works Wonderfully All Over The Body. Back Hurt After A Tough Day At The Office? Shoulders Sore From Cutting Wood? If You Spend The Day Carrying Around A Baby And Your Neck Is In Knots, Let Our Relaxing Heat And Powerful Shiatsu Nodes Rub Away The Tough Parts Of Motherhood. Whether You’Re An Active Athlete, A Stay-At-Home Dad, Or A Mom Trying To Find Some Personal Time After A Long Day At Work, The Dr Physio Heated Shiatsu Massager Will Help Massage You Back To Good Spirits. Product Details: Four Massage Nodes Sooth, Comfortable Heat (On/Off) Lightweight, Handheld Design Multi-Directional Massage Functionality Great For Work, Home Or On The Go Auto Shutoff Safety Power: Ac Adapter And Car Adapter (Included) Don’T Go To Bed After A Long, Hard Day Without Giving Yourself A Relaxing, Full Body Shiatsu Massage. Get Yours Today By Clicking ‘Add To Cart’ Above. Regular massage is a must to keep your body physically fit and relaxed. 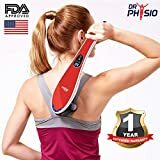 DR. Physio Neck Massager works wonders for full body massage on body parts as back, foot, calf, shoulder, neck etc. It relieves tension in the muscles. DrPhysio Neck massager provides deep-kneading and relaxing heated massage with 8 different kneading nodes. Start the pressure kneading motions of a Shiatsu massage to deliver powerful relief for neck, back, and shoulder, abdomen, legs, and feet pain. It is designed for your convenience to use at all times.